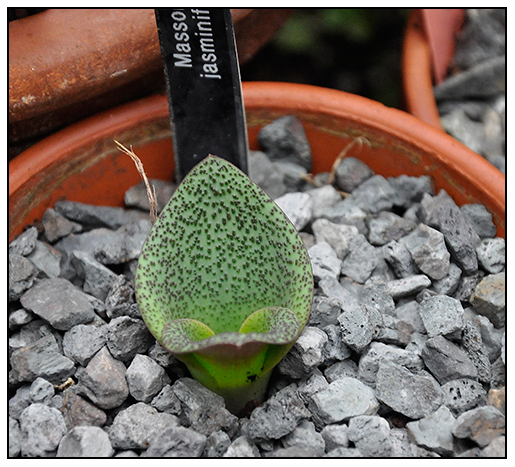 A SOUTH AFRICAN BULBS, MASSONIA JASMINIFLORA, SLOWLY EMERGES ITS TWO LONELY BUT QUITE BEAUTIFULLY PATTERNED AND TEXTURED LEAVES, AFTER BEING DORMANT ALL SUMMER UNDER GLASS. 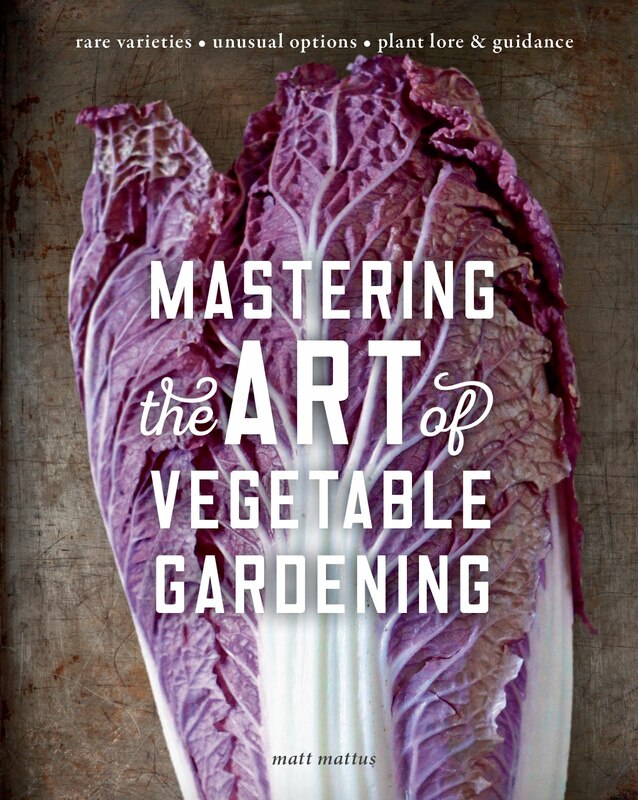 This time of year comes so fast, that many of us gardeners are never prepared for it. In the north, the first frost always seems to come as if Mother Nature has a secret sadistic strategy to make seasonal transition a surprise, even to those of us who know the inevitable will come, we often gamble and wait until the last moment - which, I remind you, will not come on a Saturday night, it will arrive after a long, drenching cold rain, which will make the large tubs of Agapanthus and Gardenia virtually impossible to move, requiring sheets and bed linens having to be dragged outdoors to bundle and drape over precious potted plants that would have to be moved in later, once they have dried out a bit. 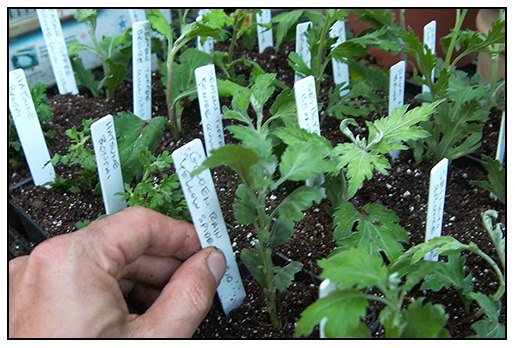 We have yet to have a frost threat here in central Massachusetts, but it is near, and we travel planned over the next few weeks, I have been trying to move plants back into the greenhouse earlier than I normally would. I had been thinking about the dreaded greenhouse heating bill this winter, even thinking about not heating it for one season, and seeing if I could keep some plants in the cellar or in an unheated room, but that decision has not yet been made, so for now, the greenhouse is still being populated. AN AVATAR FARMER IN SECOND LIFE, FLIES OVER HIS FIELD OF BLOOMING SUNFLOWERS. THIS VIRTUAL REALITY ON-LINE WORLD HAS PLENTY OF GARDENERS. 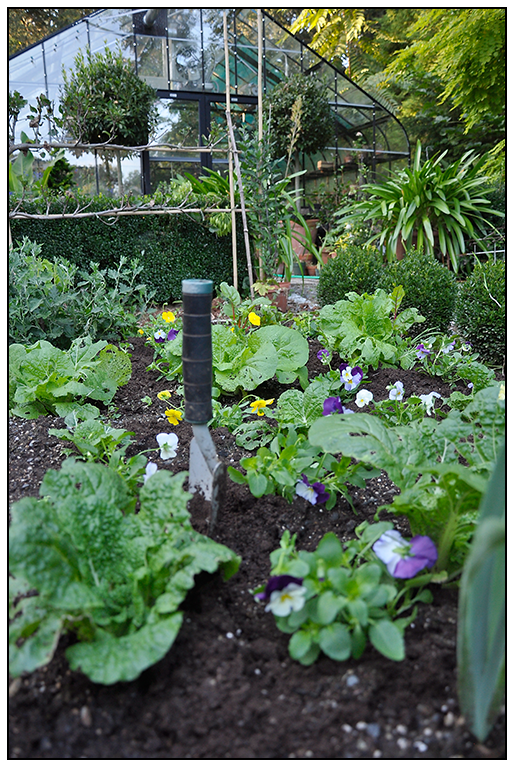 You better sit down for this one...., young people are gardening more than ever before, but not where you would think. They are gardening in their bedrooms and in their dark cellars, (and it's not pot that they are growing) they are gardening in Second Life - an on-line virtual community that had its hey day a few years back, but then no one hears about it anymore. Today, there are still millions of on-line members living out an alternative life in Second Life - they are just secretly doing it I know, because I am one of them. 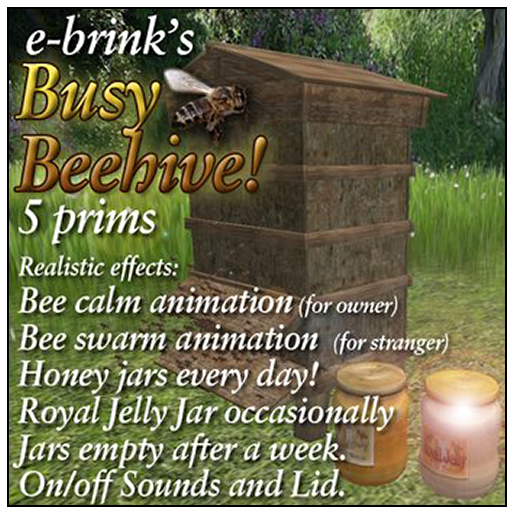 In second life, anyone can basically 'live' a second life - through an avatar, that they make for themselves. It can look exactly like you, or, it can look like anyone you want. 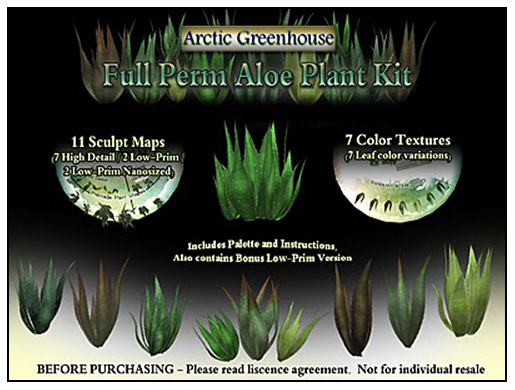 Avatars in Second Life are growing rare trees, exotic orchids in greenhouses and in their back yards. 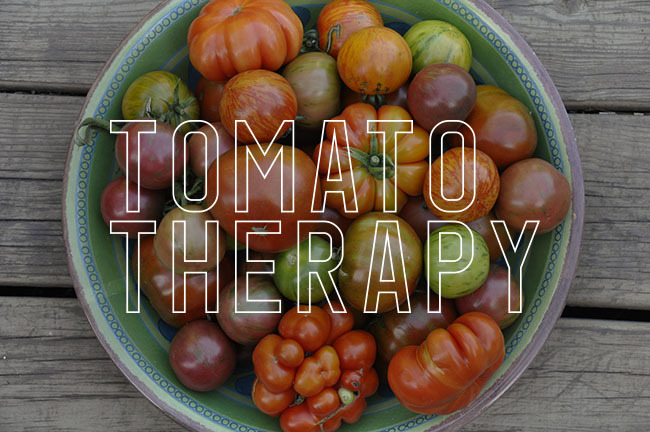 They have elaborate gardens and where they raising organic (digital) fruits and vegetables which they sell them to their neighbors, or canning and preserve in their modern kitchens ( or rustic, and you can live in any historical or fantasy world that you wish). Don't assume that all playing or living in a virtual world are uneducated gardeners, just check out some of the plants that I found today. ( it was raining, so I thought that I should weed my digital garden instead). 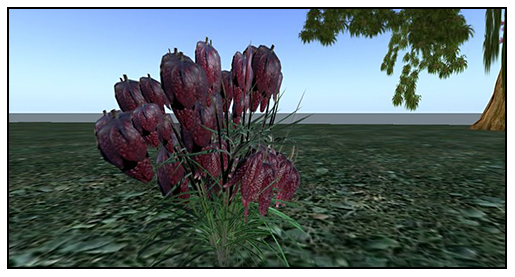 AN SECOND LIFE BULB STORE SELLING FRITILARIA MELEAGRIS BULBS THAT WILL BE EVER BLOOMING IN A SECOND LIFE GARDEN, WAVING IN THE BREEZES OR POKING THROUGH THE SNOW. 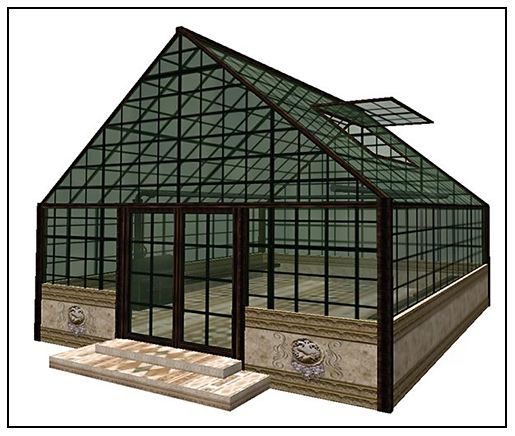 A GREENHOUSE STORE IN SECOND LIFE POWERED BY UNDERGROUND VOLCANOES. YEAH, YOU CAN MAKE THIS CRAP UP. 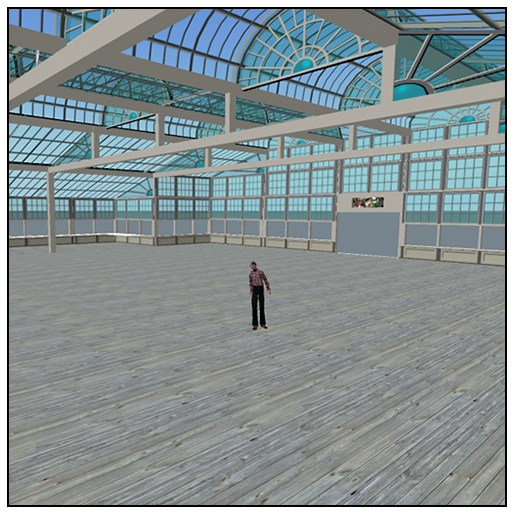 It's true, an entire global community has discovered Second Life - an online virtual world that has been around for about ten years now, but one which has not gone away. I admit that I have been a member living in Second Life for about 6 years now, where I have built a house or two, have a ski lodge, an alpine garden and keep some aquatic plants in my geenhouse - it's addictive and fun, but I never thought about exploring the world to see who is gardening here - so this week a flew and transported around the world of Second Life, and I was a little shocked at what I could find for gardeners. Most everything! 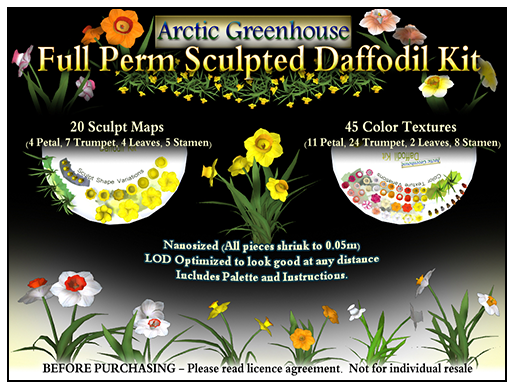 GALANTHUS ( SNOWDROPS) AND OTHER GARDEN PLANTS AVAILABLE AS SCULPTED PRIMS - TERM USED TO DESCRIBE THE COMPLEXITY OF THE DIGITAL SCULPTURES, EACH PIECE OF LAND IN SECOND LIFE ONLY ALLOWS A LIMITED NUMBER OF PRIMS, WHICH STANDS FOR PRIMITIVES - 3D MODELING TERM. 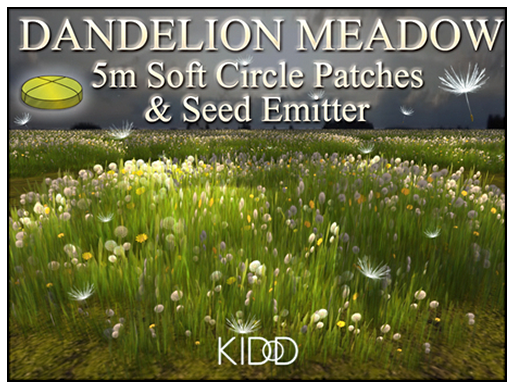 ONE CAN PURCHASE A MEADOW OF WHEAT COMPLETE WITH FLANDERS POPPIES, OR A DANDELION MEADOW WITH SEED EMITTER - OH WAIT, I ALREADY OWN THAT! (PLUS A CRAB GRASS GARDEN!). In Second Life, one uses a currency called Linden Dollars, which you can earn each week or from selling digital product such as carrots that you raised, or T-shirts that you made for other avatars to wear. Yes, there are even some people who have made thousands of dollars in real life from selling digital clothes in Second Life ( SL). But most just join ( it's free for a basic membership, but costs $9.99 per month for full access) just to play around in...well, a virtual world. 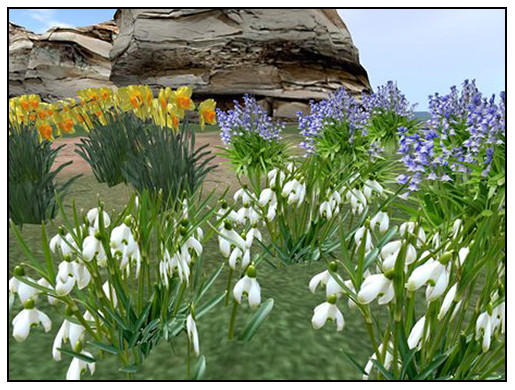 JUST IN CASE YOU THINK DIGITAL GAMERS ARE NOT SOPHISTICATED, CHECK OUT THE AVAILABILITY OF ALPINE PLANTS - SAXIFRAGES, GENTIANS AND LEWISIA MODELS. I ALSO SAW AN EVENING GOWN FOR SALE MADE FROM GENTIANA ACAULIS BLOSSOMS. HEY, IT'S VIRTUAL, SO WHY NOT? 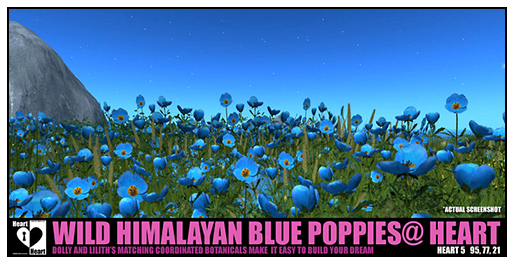 AS THE TINY TYPE STATES - THIS IS AN ACTUAL SCREENSHOT OF WHAT YOUR MEADOW OF WILD BLUE POPPIES CAN LOOK LIKE! YES, MECONOPSIS MIGHT BE IMPOSSIBLE TO BLOOM IN MY MASSACHUSETTS GARDEN, BUT AT OUR FLOATING BEACH HOUSE I CAN GROW THEM BY THE THOUSANDS, AND WHO CARES IF THE UNICORNS EAT THEM! 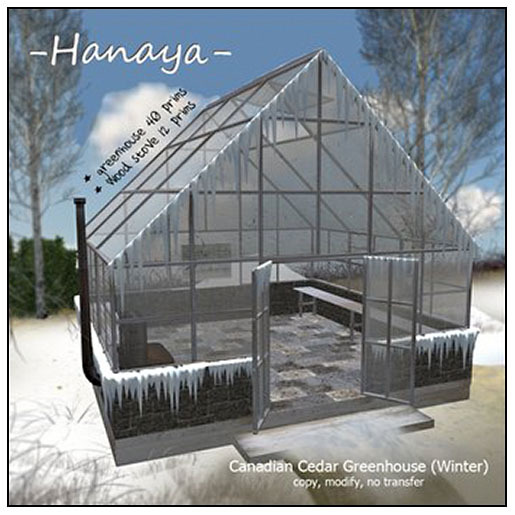 IN CASE YOU ARE LOOKING FOR A GREENHOUSE IN SECOND LIFE, THERE ARE PLENTY TO CHOOSE FROM. SOME WITH HEATERS, AUTOMATIC WATERING SYSTEMS AND BENCHES. In SL you can be whatever you want, yes, even a dragon with a leather skirt. Why not? You can by a helicopter and fly around, a jet fighter ( I had a big fancy speed boat for a while, but it was too expensive to dock and buy gas for). Most rent apartments in various cities or island condos, then go out and buy furniture, clothes, hair, shoes, etc. Just like real life. Sure, there is a rated X section too, and it's hard to avoid it online, but there are real companies in SL too. Many architectural firms use the platform to built test houses and buildings, there are real government buildings, even bank teller machines. I EVEN FOUND ONE THAT LOOKED EXACTLY LIKE MY ONE IN RL ( REAL LIFE). OF COURSE, IF I COULD HAVE THIS ONE IN REAL LIFE, I WOULD BUILD THIS ONE. Imagine building your own home, let's say, in the Swiss Alps. then, you can go buy a greenhouse or two, and then buy rare plants to grow, or trees and shrubs for your yard. It might snow, so be careful, there is weather in SL! But nothing will freeze. I hope to build a replica of my own home and garden, and then have some fun with it. This is what many large firms are doing, IBM even has an island where they test out structures and models. WOLEMI PINES FOR ONLY $25, AND A FULL GROWN ONE ALSO FOR $25. AND, I COULD PICK UP A PAIR OF SWEET BOARD SHORTS FOR $350! WTF? BUT REMEMBER - DOLLARS HERE ARE L$ or LINDEN DOLLARS, AN ONLINE CURRENCY. I CAN BUY ABOUT 20,000 LINDEN DOLLARS FOR $20. I HAVE NEVER BEEN ABLE TO GET MY AMORPHOPHALLUS TITANUM TO BLOOM, I THINK MY GREENHOUSE IS TOO COLD. BUT NOW THAT I HAVE A GREENHOUSE HEATED BY UNDERGROUND VOLCANOES, I SHOULD HAVE NO PROBLEM. AND THEY ARE CHEAPER THAN A PAIR OF BOARD SHORTS! 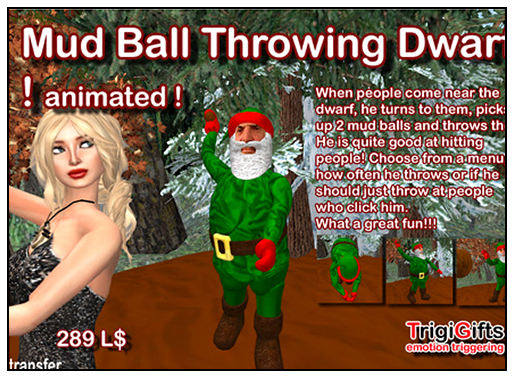 SIMS, IS THE COMPETITION, BUT IT IS A PLATFORM GAME, SO IT REQUIRES SOFTWARE. IT TOO HAS AN ACTIVE GARDENING WORLD - CHECK OUT THE LINE AT THIS NURSERY. I PREFER SECOND LIFE, AS I CAN RIDE A ZEBRA NAKED INTO A FLOATING GARDEN CENTER IF I SO WANT TO. AND WHO WOULDN'T WANT TO DO THAT JUST ONCE IN THEIR LIFE? 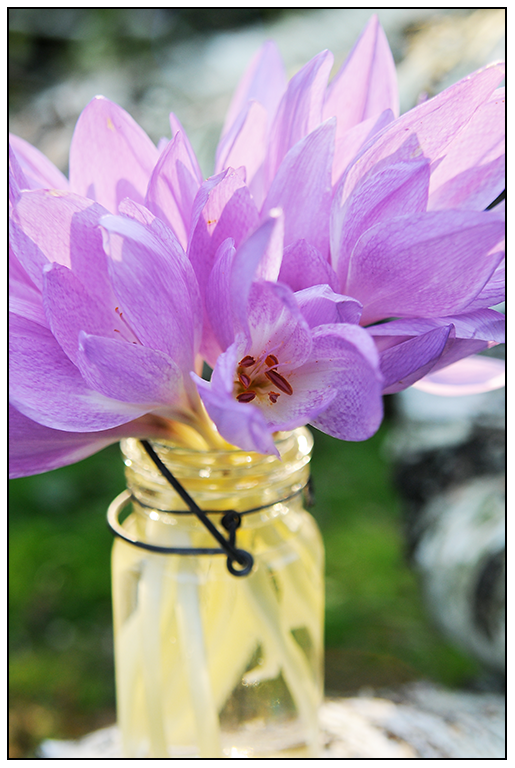 Colchicum make excellent cut flowers, they can last more than a week in water, and picking them will actually make your display next year even better. 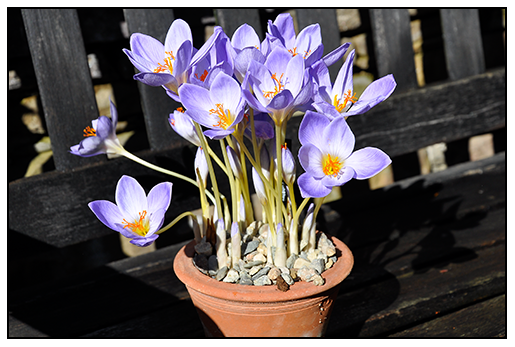 The true Autumn Crocus - those true crocus species which bloom in the autumn which are organized by plant taxonomists firmly within the genus Crocus, and their look-alike cousins, those plants in the genus Colchicum - and also sometimes listed as 'autumn crocus' can be confusing to many new ( and experienced) gardeners. 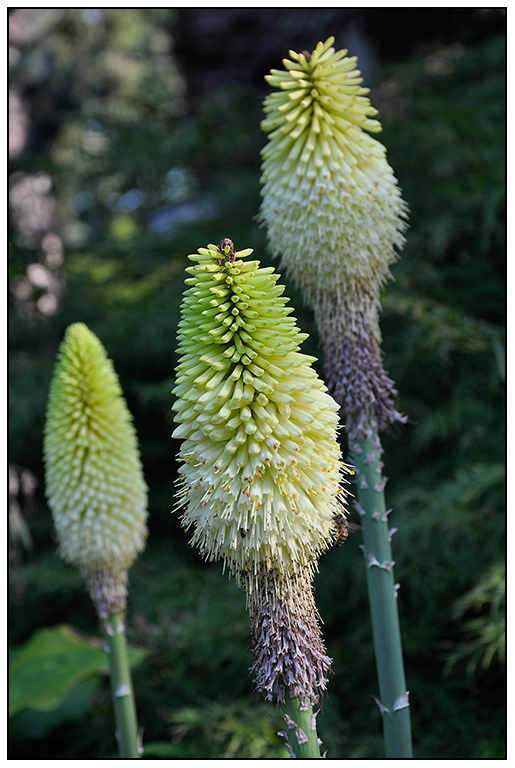 Don't fret - both are easy and long-lived in the garden, and they may be the most economical bulbs money can buy. Once only grown by the most adventurous of gardeners, these autumnal bulbs are becoming more popular, but ever-so-slowing. I have a theory about why these bulbs are still not common in most of our gardens - we have a short attention span, and although when we see their brilliant violet or white blossoms each autumn, it is already too late to purchase them, and by the time spring comes around, they are a distant memory. 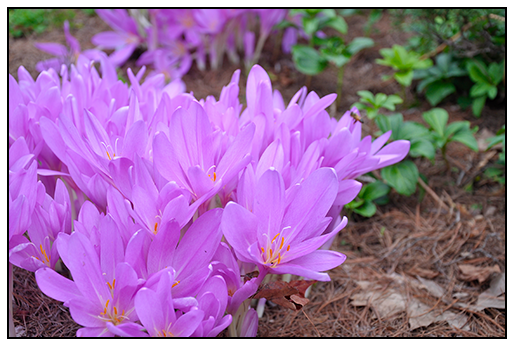 Colchicum and Autumn blooming crocus are then just grown by the organized, and the planner-types. So take note. At least for next year. Until then some tips about both of these bulbs. Colchicum are available in about a dozen species and selections commercially, but remember to order them during their short period of availability - July and early August. The double form sold under the cultivar name of 'Waterlily' is one of the finest, yet single forms can put on an equally spectacular display as seen above. 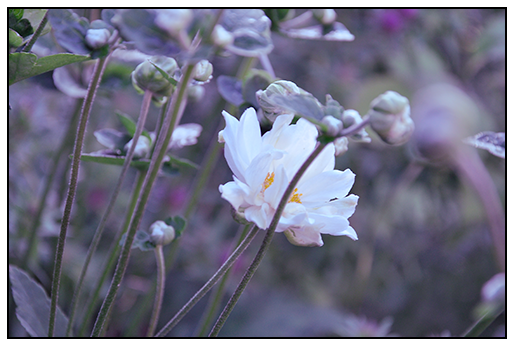 Colchicum, if happy, gradually divide into larger clumps. I have some that have been growing for thirty years, and they only get better every year. 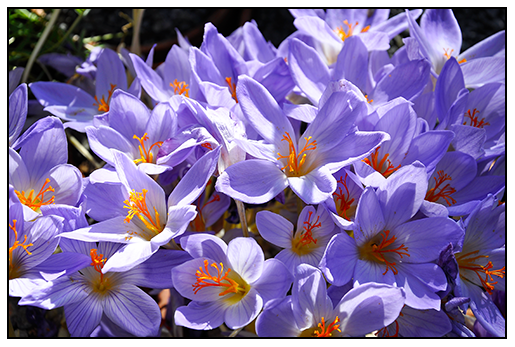 Autumn Crocus in commercial catalogs are terribly mixed up, with names and cultivars often being mislabeled. I wouldn't worry, as many commercial varieties are simply all the same one - last year I ordered six species, and three named forms and they were all the exact same cultivar ( see above). I'm not complaining, the display was spectacular. 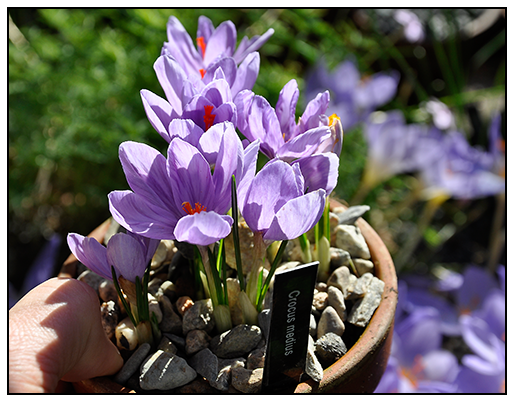 Autumn Crocus, if planted as soon as they arrive in late September, will bloom in a few weeks. -Think - purple paperwhites, and plant a few dozen in containers for doorsteps and windowsills. Then slip the rootball's into the garden after bloom, for a repeat show next year. 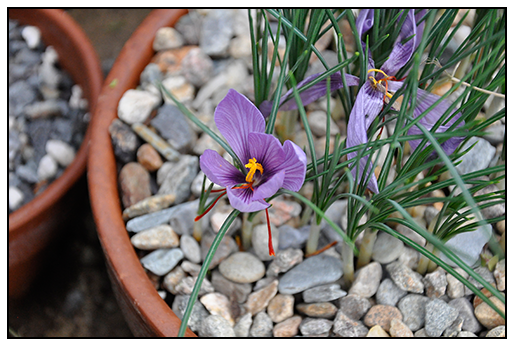 Crocus medius, another muddled species - related, but hard to properly identify with commercial stock. I would need to purchase bulbs from a European collector to get proper species - something to save for my retirement project. For now, I just enjoy whatever I can get. Saffron Anyone? 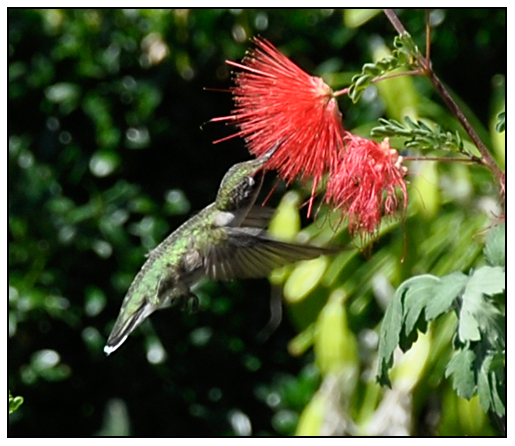 It's not the yellow pollen that supplies the world's most expensive spice, it's the stigma. See the distended parts here? I dare not pick them, not because I want seed, since most if not all C. sativus are sterile, it's that I would need to plant the entire greenhouse just to get a single ounce. 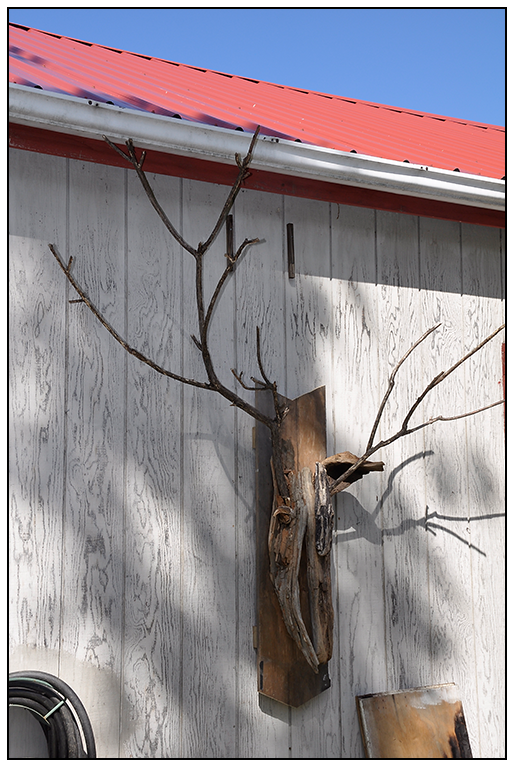 Kris Paulson a lead designer from our Furby team, made this faux deer head wall hanging. I just returned from three awesome days of creative rejuvenation at Snow Farm - a New England creative retreat located in WIlliamsburg, MA. I rarely write about my day job at Hasbro, mostly because I can't - I'm not allowed to mention what projects I work on, or what properties - in many ways, it's like working for a top secret division of the government, except instead of the Army, we work on G.I. Joe and Transformers. There are many benefits in working in such a job, my position as a creative director allows me to work with an extremely talented and diverse group of creative people - the culture is super vibrant, super fast paced and super interesting, but all that Monopoly and Elmo fur can get old, and working behind locked doors with secret codes can make a creative pretty restless - so this past week, all Hasbro designers in design & development ( R&D) were zipped off to a creative offsite to let loose and, well...create. PURPLE NICOTIANA ADDS A BRIGHT NOTE TO A VIOLET AND BLUE BORDER. 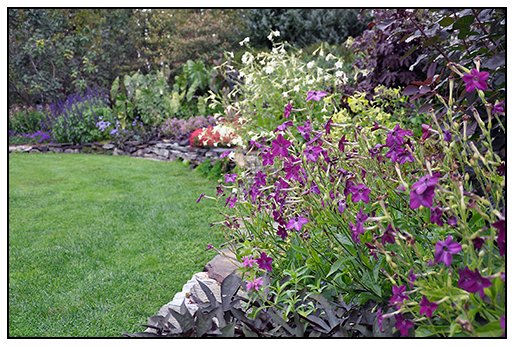 HERE IS A GREAT EXAMPLE OF HOW MASS PLANTINGS OF ANNUALS CAN BE EFFECTIVE IN BORDER PLANTINGS, AND HOW COLOR SCHEMES WORK WHEN MULTIPLE TINTS WITHIN A COLOR FAMILY ARE USED TOGETHER. 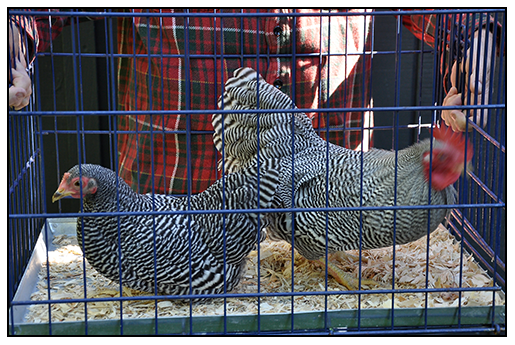 With state fairs and poultry shows ending for the season, local poultry clubs often hold poultry auctions or swaps, where everyone from backyard urban farmers to those who raise poultry for trade and market, sell their stock. 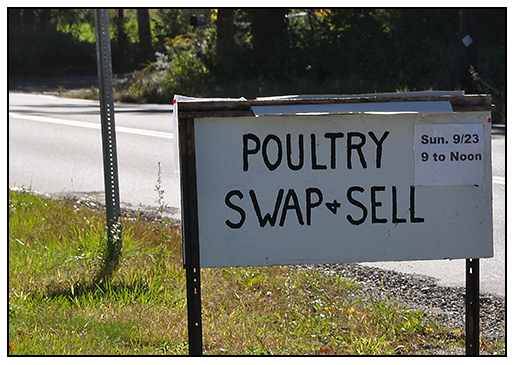 Poultry swops are terrific places to meet other poultry enthusiasts, and if you are just starting with your own flock, these are often the best places to get advice and make connections locally with experts. Nothing says that it is springtime more than the appearance of bright colored Pansies, but why would anyone want to buy and plant them in the fall? You may have noticed pansies and other annuals available for sale at your local home center and wondered 'why pansies in the fall?". It's not that unusual to see pansies showing up at garden centers along side pumkins and mums, as traditionally, pansies were always planted in autumn - the idea of a spring planted pansy only came about in the mid 20th century.Fall planted pansies actually perform better than spring sown plants in much of the US and UK. If you live in Zone 5 or higher, I suggest that you try planting some this fall - both for late fall color, and hopefully, a spectacular show in the early spring. Chrysanthemum season is nearly here, but aside from those hormone drenched, growth-retardant treated perfect mounds that we see at every garden center, our current love/hate relationship with this autumnal standby goes much further back in horticultural history than this current mumification of North America - the Chrysanthemum may very will be the most cultivate flower on our planet, yet few of us ever see the sheer beauty this genus can produce. To truly appreciate the Chrysanthemum, we must first look backwards more than 3000 years ago, for in China and Japan hundreds of varieties were grown to perfection for autumnal celebrations and winter holidays. 1. Did the name Chrysanthemum really change recently? Yes. No*. see end of paragraph for revision. We really should not be calling these plants Chrysanthemums anymore. If you really want to show off, Chrysanthemum is incorrect thanks to taxonomists who reorganized the genus, but I don't ever expect the retail growers to ever change their signs in much the same way that any bicolor corn will forever be 'Sugar and Butter'. Scientists recently have moved many of the species which we once clumped together under the genus Chrysanthemum into a multitude of genera, leaving only two species in the genus of Chrysanthemum - two annual daisy forms in fact. Our familiar Hardy Mum plant which we all visualize as a 'Mum' as well as all of the florist varieties, is now known as Dendranthemum. 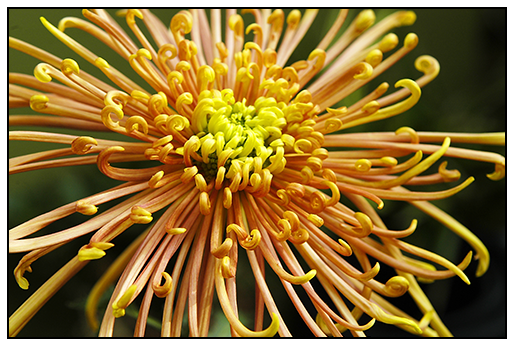 * Apparently, the name Chrysanthemum is still being used. 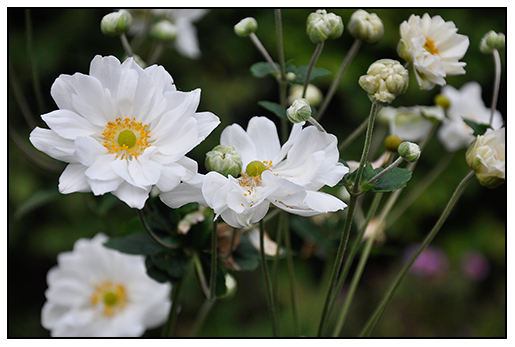 Thanks to a blog reader who shared his thoughts, I researched this a little bit more, and here is what I found: Both Chrysanthemum and Dendranthema are still valid, but Dendranthema is now a subsection within the genus Chrysanthemum. ( Often called Chrysanths). The name I learned to use back in college, Chrysanthemum x morifolium is still sometimes used once again, but finding any literature on this has been challenging without access to JSTOR or an botanical university library - I welcome any expert to share their knowledge! The last update that I could find was from the taxonomy journal TAXON in 1998, a citation with a proposal to conserve the name Chrysanthemum (44:439-441.). Web searched find anecdotal reference for a change back occurring in 1999, but I could find no factual information. I did find this list which may help the geekier of us, to find where other members in the genus netted out. Oh, thank God I never became a taxonomist! I think that they must be the lawyers of the plant world. Rhodanthemum (Moroccan daisies, 12 species) - C. hosmariense, C. gayanum, C. atlanticum). 2. Are my newly potted 'hardy mums' really hardy? Sorry, they are not really 'hardy'. The Mums that we see in garden centers are NOT reliably hardy in most North American gardens, so forget what you read in books or what the sales associate tells you, it's just the sad truth. These are varieties designed to be disposable. I know, I know - technically, they are considered to be a 'hardy perennial' in many gardening books, but the modern varieties used to commercially produce the common mum plant that we see sold as 'Hardy Mums' are not truly bred to be hardy. I'm not saying that some will survive, but proceed and invest carefully, as winter hardyness varies between the many varieties sold. 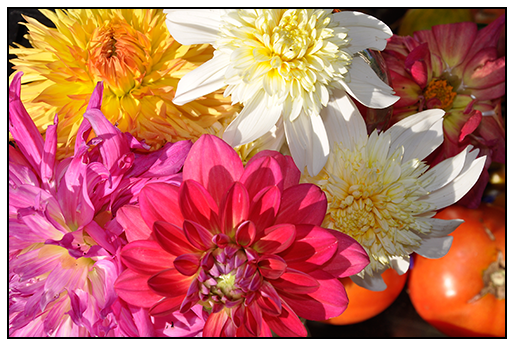 Breeders select varieties for color and uniformity more than they do for hardiness. So thanks carefully before investing in that $16.00 giant perfectly grown mound. It may be best to consider the purchase a disposable one. 3. Why don't we ever see Spider mums and Football Mums in our gardens? These varieties, along with many other beautiful forms are all known as exhibition mums, not only are they late bloomers - often flowering in late October and November, they are also more demanding to grow - requiring often daily care, staking, disbuding, trimming to only one or 3 stems, and heavy feeding. Growing exhibition mums is quickly becoming a lost craft, but as many of you already know, it is one which I am fervently trying to reintroduce. Soon you will all see my exhibition mum collection, as it is one of my 2012 Projects, but they are not ready yet - but here are a few photos to show you where I am with them. 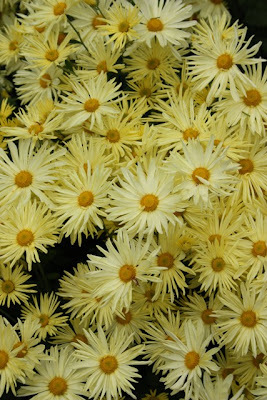 Image of Chrysanthemum 'Gethsemane Moonlight' courtesy of Plant Delight's Nursery. 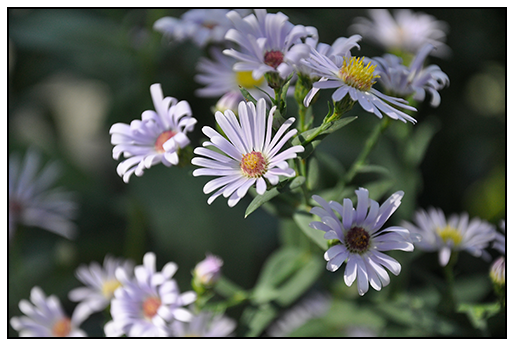 Chrysanthemum 'Gethsemane Moonlight' is a truly hardy mum, which is more reliable and truly perennial in the border. 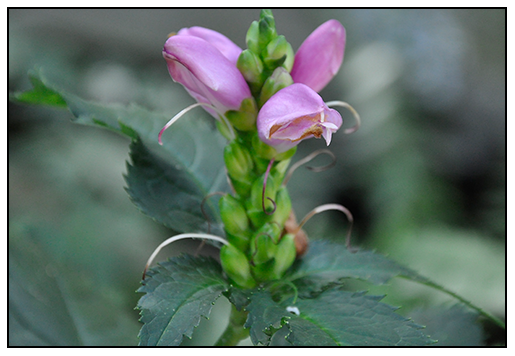 Look for other named varieties in white, peach and pink available from Tony at Plant Delight's Nursery, of course! 4. There are some very nice truly Hardy mums - but you had better like daisy-shaped flowers. It's true, some truly perennial mums exist, but don't expect them to be as dense and nice as the tight buns seen at retail right now, these are more loosely growing, more like daisy's than what you might imagine a chrysanthemum to look like in your mind, but these varieties spread slowly, and will quickly become a share-a-long plant. Look for Chrysanthemum 'Snow Dome', or Chrysanthemum 'Gethsemane Moonlight'. 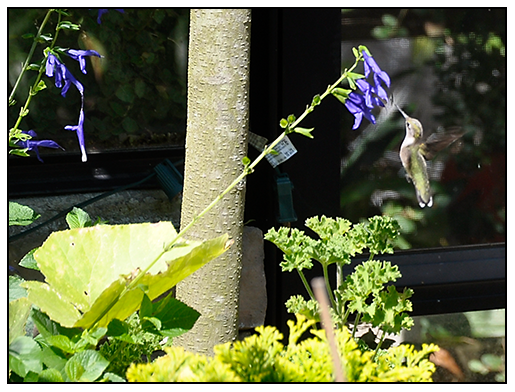 both from Plant Delights Nursery. My Exhibition mums arrived as cuttings in may, and were quickly potted up. In June more cuttings were taken, at on the Fourth of July, another set. After the Fourth, no more stopping occured, and plants were allowed to product only three stems per plant. Exhibition Cuttings arrived earlier this year, in May, which gave me some time to take two or even in some cases, three sets of cuttings, essentially tripling my collection. These will mature into tall 6-7 foot tall exhibition mums by late October, when the pots, complete with 6 foot tall bamboo stakes, will be relocated back into the greenhouse for blooming in late Autumn. This is a method used by growers for hundreds of years in the US and European estates where the Chrysanthemum was often the first floral show in an estate conservatory, but of course, the Japanese and the Chinese had more elaborate methods which they perfected over 3000 years. Growing mums like this time consuming, and impractical, but I am fascinated with heritage methods - those that come from another time when wood and glass stove houses kept rare orchids and giant palms. Exhibition mums are not for the home grower, but I am sharing with you the process, since I think it is interesting, and it is something you can try, if you have a cold porch or sunroom where you can bring the pots in for their display period. Exhibition chrysanthemum culture is a long, tedious process, hearkening back the 1800's. when any New England Estate with a greenhouse complex, would have been practicing. Even in Europe, and particularly in England, mums would be planted out into staked rows in a bed behind the greenhouse complex, and carefully maintained until frost arrived. They then would be carefully dug and repotted, and brought into the cold glass house for final prep and they display which would soon follow. It's a method and culture sore rarely seen today, that one may only experience it at some of the worlds leading botanic gardens. An exhibition of tall, trained and staked mums in a conservatory or courtyard is a relic from another time, but I am dedicated to continue this art as long as I can in my own home greenhouse. 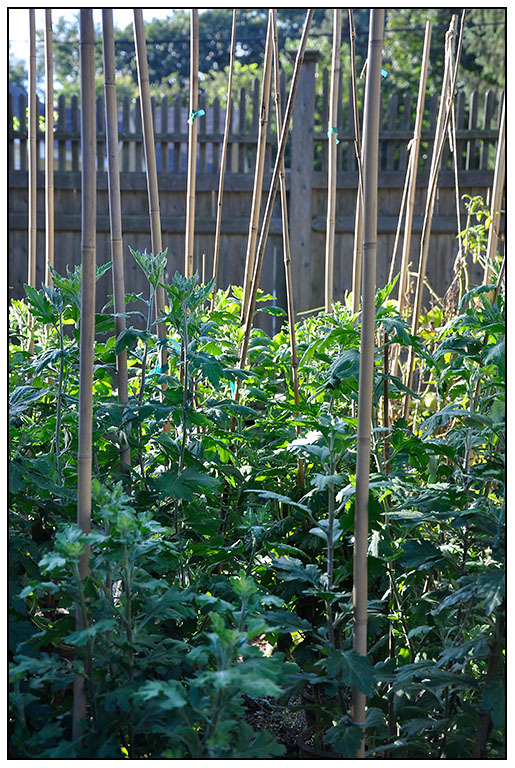 MY EXHIBITION MUM CUTTINGS ARE NOW MATURING, AND THEY ARE NEARLY AS TALL AS I AM. 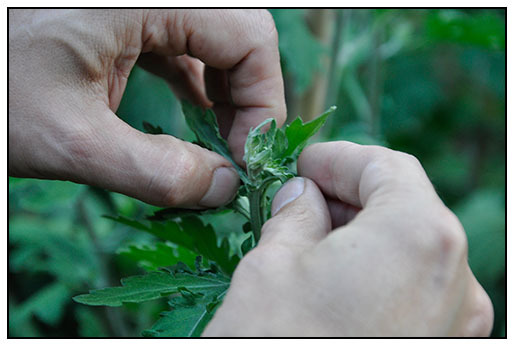 FLOWER BUDS ARE BEGINNING TO FORM, BUT ALL SIDE SHOOTS MUST BE REMOVED, AS WELL AS THE TINY BUDS, LEAVING ONLY ONE FLOWER BUD PER STEM. 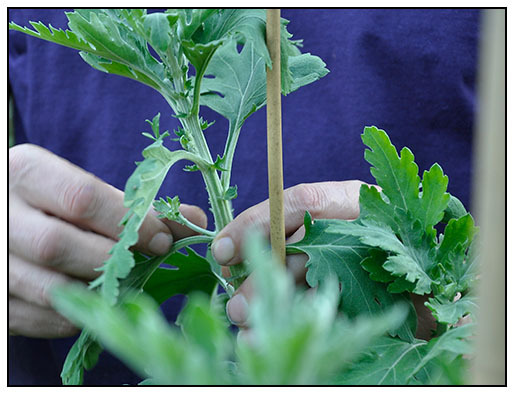 NO FLOWER PRODUCING STEM IS ALLOWED TO MATURE, SO DAILY NIPPING AND SNIPPING IS REQUIRED. 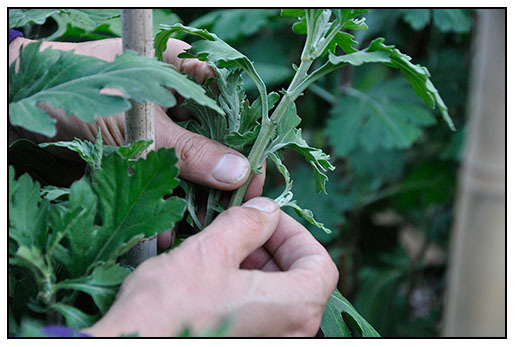 IT IS BEST TO REMOVE STEMS BEFORE THEY GET TOO LARGE. ONCE ALL SIDE FLOWER BUDS ARE REMOVED, THE CAREFUL TASK OF REMOVING ALL BUT ONE SINGLE CROWN BUD REMAINS. TIMING IS EVERYTHING HERE, FOR ONE MUST REMOVE BUDS WHEN THEY ARE STILL EASY TO ROLL-OUT WITHOUT MUCH DAMAGE, BUT NOT TOO SOON WHICH MIGHT DRAIN ENERGY OR DAMAGE THE ONE REMAINING BUD. THIS REMAINING CROWN BUD WILL NOW GROW INTO A GIANT, PERFECT EXHIBITION MUM, BE IT A SPIDER, FOOTBALL, INCURVE OR RECURVE TYPE. MY 'GROWING WITH PLANTS' EXHIBITION MUM PROJECT - STILL GROWING, BUT SOON TO BE RELOCATED INTO THE GREENHOUSE ONCE FROST THREATENS. FLOWERING WON'T OCCUR UNTIL LATE OCTOBER OR NOVEMBER. 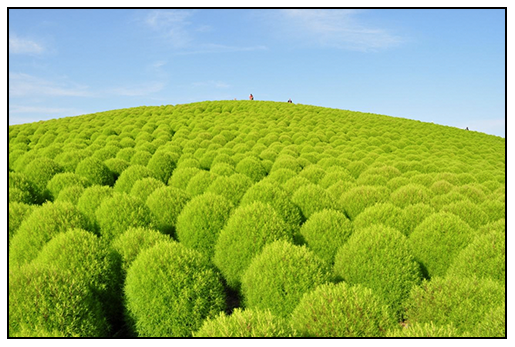 I am about to share something completely new to you - the Japanese Flower Park. Flower festivals are not unique in Japan. This is a country which has its Cherry Blossom Festival, and autumn still belongs to the Kiku festivals, (the Chrysanthemum festivals which are held throughout Japan in November),and there are the annual Matsuri festivals celebrating the rice harvest. These are completely different - these newer festivals make our corn mazes and pumpkin fields look as boring as, well, a field of corn. Flower Parks have become the all the rage in trendy and stylish Japan, with a new one opening most every week in the autumn. 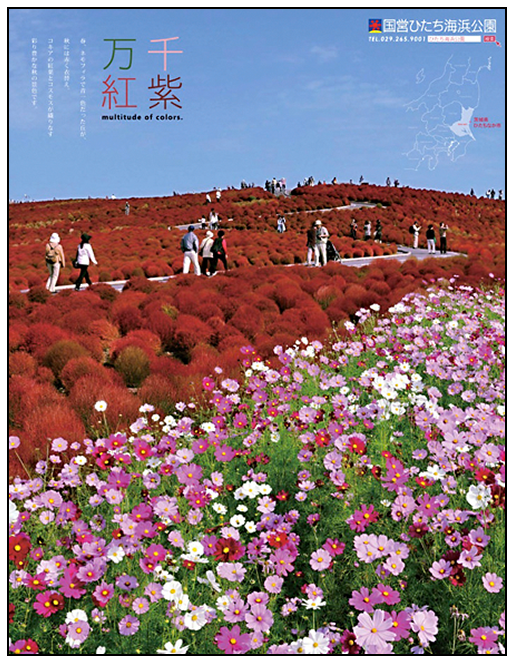 What makes these flower parks so amazing is not any religious significance One can see millions of Cosmos in September and October at Ushiku, where a virtual blanket of punk and white extends as far as the eye can see, attracting thousands of daily visitors who take the train from Tokyo there. Then, there is the popular and perhaps the most impressive Hitachi Fuudoki no Oka , the 3000 meter park where zinnias and other flowers are planted for fall photos and appreciation. 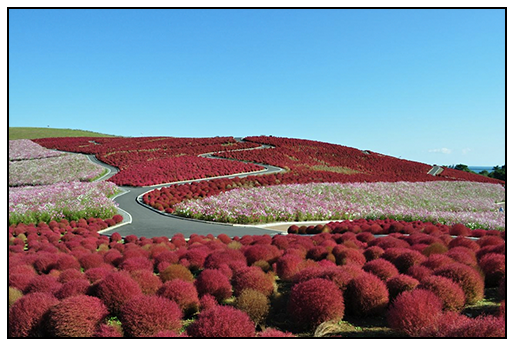 Nearbuy, the Hitachi Kaihin Park which, was already famous for its spring bulb displays of tulips and daffodils, it now extends displays well into autumn with massive planting of Kochia, the Burning Bush. This single installation has annually taken Japan by storm. So I ask you.... are these displays just one of the many beautiful quirks of Japanese culture, or is this something that we could recreate here in the USA? 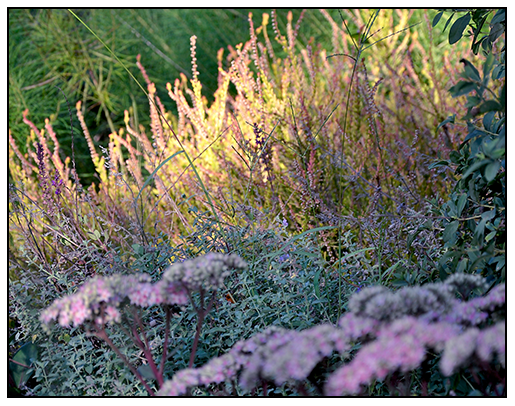 I am not sure if anyone aside from a seed company, cultivate 30 acres of kochia here in America. What do you think? I am also wondering why the Japanese find these fields so fascinating...on one hand, I get the appeal visually, as this sort of event-spectacle feeds the the Japanese aesthetic, but I am guessing that most visitors are un-traditional Japanese flower viewers - this is not the kimono wearing - flower shrine visiting type of viewers who might attend an Ume Plum festivals in February. I imagine that the connection being made here is less secular, and more anime. These spectacles are more Mothera than Matsuri. 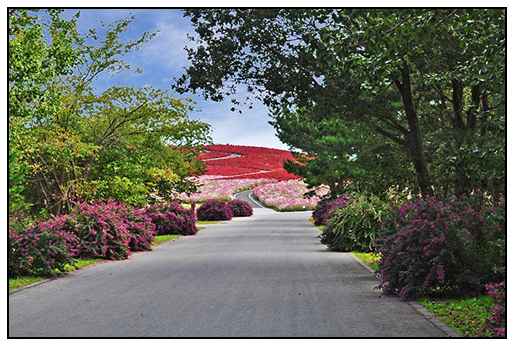 Either way, these flower parks pack a lot of appeal into a few acres. Maybe the lesson here is this: plant a flower by the gazillions, and they will come. Maybe these are the flower show of the Millennium? Brilliant fields of flowers blooming as far as the eye can see attracting trainloads of viewers, only because it is so incredibly beautiful. It's Wizard of Oz meets Tokyo Disney, but with a twist - a very pretty one. ALTERNATING FIELDS OF KOCHIA FIRE BUSH AND COSMOS MAKE FOR AN UNFORGETTABLE EXPERIENCE WILLING TO GIVE ANY CORN MAZE A RUN FOR ITS YEN. 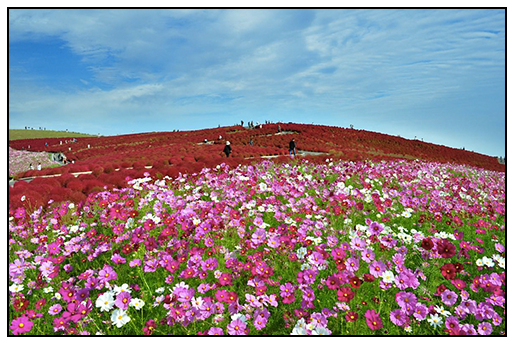 Cosmos in peak bloom at the Hitachi Seaside Park. 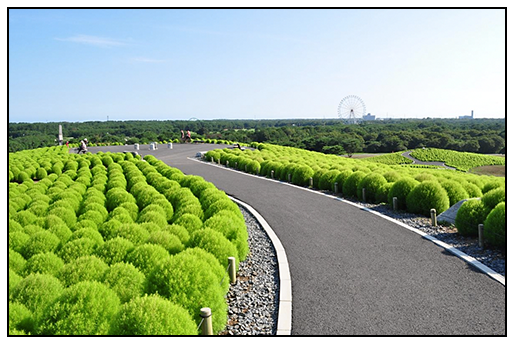 For the real plant geeks, a treat awaits at nearby, at Kinchahuda, Hidaka City. For 6 short days in September, more than a million Lycoris bloom in a planted woodland. Also known as Spider Lilies, Lycoris known as Higanbana in Japan, this woodland meadow attracts crowds. 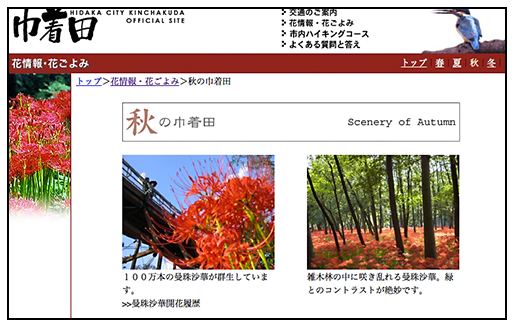 You can find more images at the Expat's Guide to Japan site, and if you can read Japanese, visit the official Spider Lily Site for Higanbaba at the Hidaka City Kinchakuda Site. 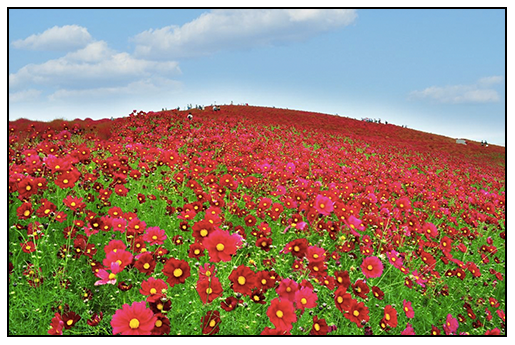 It doesn't end with Kochia, for this entire display of volume and numbers begins in early spring, blue Nemophila flowers, which bloom alongside acres and acres of tulips and golden mustard flowers. These weeks are known as the Golden Week, at the park, but I've seen mustard grown ornamentally in public parks in Tokyo as early as February. 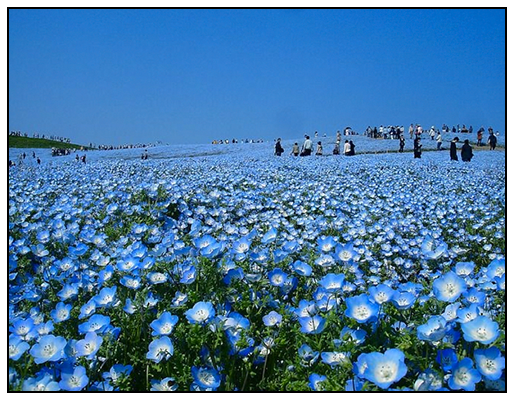 Nemophila Harmony Festival happens in May, in Hitachinaka. If you find yourself in Japan this autumn, be sure to hop a JR train and visit one of these amazing displays. Access from Tokyo: From Ueno Sta., take the JR Joban Line super express “Hitachi” to Katsuta Sta. From Katsuta Sta. take the local bus from bus stop #1 and get off at Kaihin-Koen-Nishiguchi.